"It’s rare to find a young professional company of the calibre of Pop-Up Opera with the energy to bring opera to new audiences in such unexpected and unexplored terrains but Pop-Up Opera has certainly appeared in some weird, wacky and wonderful places. They have performed in farms, pubs, barns, churches and even a boat made from scrap metal. This season sees them performing in an underground shaft at the Brunel Museum, Rotherhithe and delving 100 feet underground in the Clearwell Caves, an extraordinary natural cave system in the Forest of Dean. For their 2013 Spring Tour, the company revive their productions of Gaetano Donizetti’s two most loved opera buffas: Don Pasquale and L’elisir d’amore, which they performed to great acclaim in 2012 and was described as ‘a vivid and zippy show, certainly funnier and better in many ways than ENO’s and ROH’s…’ (Opera Now). Both will be directed by Darren Royston, renowned for his dynamic use of movement. The musical director is James Henshaw. Pop-Up Opera exists to make opera entertaining, without compromising quality – all operas are performed in their original language. It opens a hidden door to those who are hesitant as well as appealing to dedicated opera-lovers. Their intimate use of props, story-telling and interaction makes audience members feel as if they have been given a backstage pass. All the singers are talented young professionals at the beginning of promising careers. Pop-Up’s operas are skillfully adapted to each individual venue but always maintain the highest standards. The combination of unusual and intimate venues, along with informal and engaging productions, offers a greater connection to the singers and the music, something even seasoned opera-goers often miss. 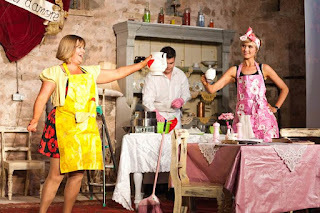 In 2010, after staging a series of opera scenes in a Herefordshire barn, the company’s founder Clementine Lovell decided to take this concept one step further and emulate the Italian peripatetic companies who travel to small towns and theatres. It wasn’t long before she achieved the same degree of success across the UK. This year Pop-Up Opera will reach wider audiences than ever before as they treble their touring itinerary. Lovell says ‘I'm very enthusiastic about our Spring Tour, bringing two vibrant productions to some very interesting and unusual new venues; as well as trialling our education programme in two schools, we hope to reach more people than ever. It is amazing to feel that we are achieving the aims I had when I set up the company, introducing new audiences to opera as well as maintaining the highest standard of performance and challenging the ways in which opera is performed.’"